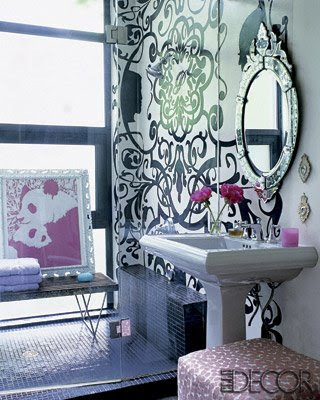 Cynthia Rowley's home is as feminine, original, and beautiful as her designs. Her awe-inspiring dining room (pictured above) is my favorite room in the house. It looks so ethereal, as if it were straight out of a fairy tale. 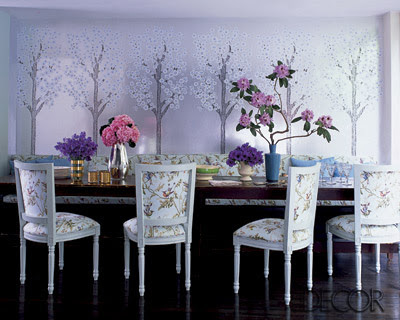 The gorgeous, metallic wallpaper was designed by Rowley and produced by Flavor Paper. The chairs and banquette are covered in fabric by Cole and Son. The loveliness of the dining room can only be surpassed by Rowley's precious daughter, Gigi. The living room plays host to Rowley's drawings above the mantel, a zebra print rug, re-upholstered flea market chairs, and a screen with a clover motif reminiscent of Van Cleef and Arpels. The whimsical master bath hosts a venetian mirror, sleek mosaic tile, and waterproof (naturally) wallpaper of Rowley's design. The mid-century chaise lounges in the garden are covered in fabric from Lee Jofa. 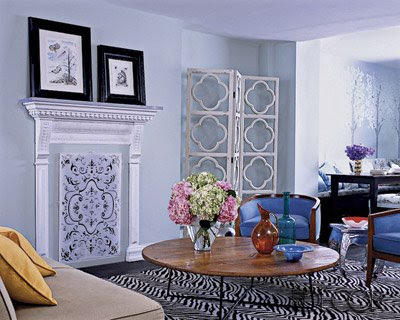 To see more of Rowley's home, check out this month's issue of Elle Decor and be sure to visit her delightful blog! Her home is gorgeous, she and her husband looks fabulous and her children are adorable. I love her home this month's Elle Decor was really good...I love the cover! I'm not surprised by any of Cynthia's decor; it is totally her. You still keeping up with Top Design? How freaky is Wisit? i love her!!! her house is such a perfect reflection of her! and her family is precious! Superb. one of the most beautifully delicious interiors ever!!! wow. I want that floor to ceiling glass door. LOVE her house.. I could move in and kick her right out and be perfectly content! Her house is divine, beautiful and whimiscal at the same time. Your settee is a great piece, but I think you need a beefier piece there. I love the idea of a daybed, so versatile and pretty from every direction. Love the upholstered selections in your post. Good luck!